With the 27-inch model, you're not short of screen space! 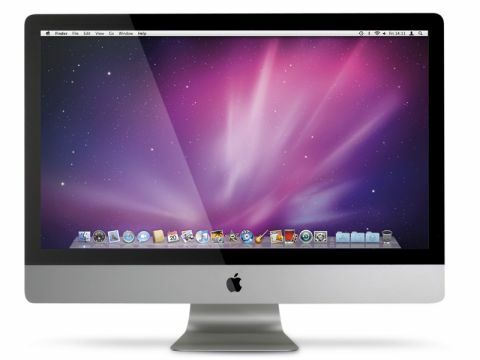 The new Apple iMac range boasts four standard configurations. We tested the second-most expensive model, which has a massive 27-inch screen, an Intel 3.06GHz Core 2 Duo processor, a 1TB hard drive and an ATI Radeon HD 4670 graphics processor with 256MB of memory. Three of the four new iMacs offered the same 3.06GHz CPU, with the top-of-the range model giving you a quad-core 2.66GHz Intel Core i5 processor, upgradeable to a 2.8GHz Core i7 at the Apple online store. We expect these new chips will filter down throughout the Mac range over time. The new iMac's glossy screen offers an edge-to-edge glass design, with no surrounding aluminium bezel. Unlike the MacBook Pro range, there's no custom option for a matte screen, which is far less susceptible to glare from lights and windows. The display is of a very high quality, but it falls short of perfection. Its viewing angles and colour reproduction are impeccable, but the LED backlighting isn't as consistent as it might be, showing a very slight dark area at the foot of the screen and a little edging during our single-colour tests. In our benchmarking tests, the new iMac performed very well in most areas, offering a small speed increase over the 2.93GHz, 24-inch iMac we tested earlier this year in our rendering tests. In our Doom 3 test it really shone, with a frame rate of 122.8 frames per second at the highest graphics settings. It looks glorious too. When a Cyberdemon throws a fireball from the display, you can almost feel your eyebrows burn. The new iMacs don't have a Blu-ray drive as standard because Apple "doesn't see any great consumer demand" for them, but we're disappointed to see it's not even available as a custom option. We were even more disappointed to find the optical drive appears to be slower than in previous releases. For several months, every new Mac has taken 358 seconds to encode our test CD in iTunes, with the speed of the optical drive the limiting factor. Yet the new iMac scored a slothful 418 seconds – that's a full minute slower. A couple of new features are only available on the 27-inch models. A Video-in port enables the iMac to be used as an external display (but only with the Mac switched on), while the new iMacs also support wall mounting using the VESA standard. All the systems in the new range can be expanded with up to 16GB of onboard RAM, and come with a Magic Mouse and Bluetooth small-form keyboard as standard. If you prefer a USB keyboard with a numeric keypad, this option is available on the online store.